Moying Li grew up in Beijing, China during the tumultuous Cultural Revolution (1966-1976). During that period, Moying was primarily self-taught, following the guided lessons and reading lists her father, who had been a prominent screenwriter, was able to send to her from a "hard labor farm." In 1980, thanks to a generous scholarship and a plane ticket from Swarthmore College, Moying left Beijing where her family still lives, and traveled to the United States to pursue graduate studies, and for the next ten years she immersed herself in what she had always craved, the unrestricted pursuit of knowledge. One of the first private scholarship students from China since the Cultural Revolution to attend a U.S. college or university, Moying earned an MA from Swarthmore College, an MBA and a Ph.D. from Boston University. Moying started publishing short stories, essays, and articles when she was still a college student in China. Her writings appeared in such publications as English Studies, English Literature, and People’s Writer. Her first book, Beacon Hill: The Life & Times of a Neighborhood, (Northeastern University Press) won first prize--the Julia Ward Howe Award, given by the Boston Authors Club. Snow Falling in Spring: Coming of Age in China during the Cultural Revolution is her second book, published and dual-listed by Farrar, Straus and Giroux, for both young and adult readers--written for booklovers between age twelve and a hundred and twelve. The book has been named "Editor's Choice" by The New York Times Book Review, as well as one of the "Editor's Favorites" by The Bloomsbury Review. It has been selected by the National Council for the Social Studies (NCSS) as a "Notable Social Studies Trade Book." It is the winner of the 2009 IRA Children's and Young Adult's Book Award, and has also been selected by the Cooperative Children's Book Center (CCBC) for The 2009 CCBC Choices List as a Best-of-the-year book. It is also the winner of the prestigious 2009 Massachusetts Book Award for Non-fiction (adult category). Snow Falling in Spring has been translated into several languages and is available in Braille as well as on Kindle and EBook-ITune. 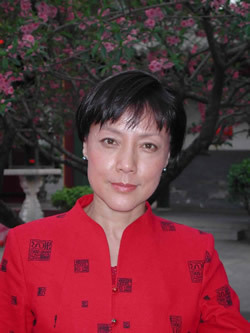 Moying was Co-Anchor of “English as Second Language” for China Central Television Program (CCTV), the largest television network in China, and also assisted programs with TV1, a French television station, as well as Christian Science Monitor’s television network. Since 1994, Moying has been a Senior Vice President and Equity Analyst for a Boston-based investment management firm. Prior to that she was Assistant Director of the International Department of the Massachusetts Port Authority. Moying began her professional career with the United Nations Development Programme in Beijing. Moying is involved with several charities and non-profit organizations. She is a Board Member of the Boston Authors Club,and is on the Board of Massachusetts Center for the Book. She is on the Visiting Committee of the Department of Art of Asia of the Museum of Fine Arts, Boston. She has been China Adviser to the President of Swarthmore College and to St. Jude Children’s Research Hospital’s China program. She is an active volunteer at Dana-Farber Cancer Institute, and is a member of its Pediatric Visiting Committee. She has served on the Allocation Sub-Committee of the United Way of Massachusetts Bay, and is President of the Boston-Hangzhou Sister City Association. Moying has lectured and written widely on business and social issues in China. She has lectured at the Sloan School of the Massachusetts Institute of Technology, Harvard University, the School of Management at Boston University, the Carroll School at Boston College, the College of Business Administration at Northeastern University, the Boston Bar Association, and the Massachusetts Export School. She has been interviewed by, among others, the British Broadcasting Corporation, BusinessWeek, the Boston Globe, the Boston Herald, the Wall Street Journal, and the New York Times on her investment expertise as well as her publications.